Some cars are meant to be driven as is. Modifications should be minimal, if even present. Some are meant to be restored to former glory. Some are meant to be returned to original condition for the purposes of flipping. But some cars are meant to become experiments, concept cars even. I consider my Honda Logo TS to be such a car. When I first laid eyes on what would become my new-to-me vehicle for the low, low price of $975, I knew I had something special. Oh, sure, not everyone can see it, a few even have asked here, “why do I care about some tiny, underpowered city car?” Wrong question. The question I asked myself is, “how can I not care about something which is essentially a baby Civic hatchback?” And I care very much indeed. For those of you who may not recall, while I drove a BMW before moving to Japan, it was purchased in part with the money I received after waking up one morning to seeing my pride and joy, my Roma Red EK hatch completely stripped in my driveway. They pretty much took everything. While I loved driving my CPO 3-series, I would never feel safe touching it. And after moving to Japan, I ended up driving lots of employer owned kei cars. Nothing I wanted to work on even if I could. Which is precisely what it is. Not just in shared design language, but a ton of shared components (also shares parts with the Integra). It’s completely fair to say that the Logo is a baby Civic, because it is. So I asked myself another question, now that I had the car, what did I envision for it? 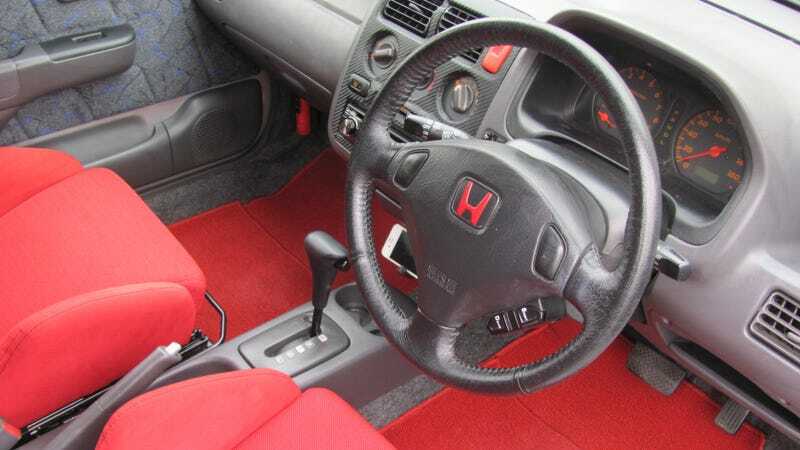 And I realised that what I wanted to do was to see if I could make a concept car for a model that Honda never made, but really should have (at least for the Japanese market): the Honda Logo Type R.
Well, with exterior, Honda has already done this with the TS/Sportic TS. The design language of the front lips and side skirts of both the CTR and the ITR have been carried over, as has the rear lip from the CTR. These were only available on the TS models. Also the power folding mirrors have also been carried over. The turn signal indicators were not, so that’s probably on the agenda. As are both a modest wing (probably the CTR’s will bolt onto the current rear spoiler) and more appropriate wheels. The car is silver, which is already a Type R color, so it’s staying. Toss on some red badges, and that’s that. After washing the carpet (I actually pulled it out, laundered it, brushed it, and returned it to the interior. I plan to replace it with red carpeting as soon as feasible) and cleaning up the worst spots on the Recaros, I decided to paint the H logo. I have found for this type of work nail polish is the best choice, because if you mess it up, or you want to undo it, just grab yourself some nail polish remover and wipe it off, but it won’t come off unless you want it to come off. ...and wrapped it in carbon fiber. The CTR console bezel also has a carbon fiber design (although from what I remember from having one in my civic, it was actually just a very thin film laid over the regular bezel, and easily scratched off). This was really hard to do, as I had never wrapped anything before, and while it looks really good in the pictures, it probably needs to be redone. I also mounted my iPhone 4 (which through my deck essentially serves now as a glorified iPod), and installed one of those very wide JDM mirrors. Also my emergency brake button was done afterwards and it looks great! Images via Kat Callahan/Jalopnik and Honda Motor Co.